They say that when one of these canoes comes to your village to pick up a young lady, and the person who is going to marry her is in that boat, all the young men have to come down and put a pole underneath the bow, all the way out in the deep water. They pick up the canoe and pack it up the beach just so this man will not get his feet wet. Large “war canoes” with projecting bows and high sterns were up to sixty feet long, with room for many passengers and thousands of pounds of gear and supplies. They served for coastal travel, trade, war, and relocation to seasonal camps. Haida men carved the canoes from tall cedar trees that grow in the Queen Charlotte Islands and traded them to northern neighbors. 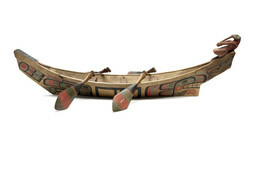 Elder Clarence Jackson said, “It was a sign of wealth when you had a Haida canoe.” They were painted with clan crests – on this model, a bear on the bow and a bird figure on the stern.